Discover Cala Millor and the coast of Mallorca by rental car. Compare the offers of car rental companies in Cala Millor online. You will get the best prices for your rental car if you book online as early as possible. With Driveboo you have the perfect partner for your rental car booking in Mallorca. The coastal town Cala Millor is one of the most popular tourist destinations on Mallorca. It is located in the east of the island in the bay of Son Servera. As the name already suggests, Cala Millor has some of the most beautiful sandy beaches in Spain. The tourist offers are impressive: the blue Mediterranean Sea, white houses, palm trees and lots of sunshine are characteristic for the idyllic region. Visitors can find pure relaxation in the beautiful surroundings, where they may explore cities and natural wonders. The easiest way to get to know Cala Millor and the surrounding sights is by rental car. Many destinations worth seeing can be reached in just a few minutes. The Driveboo price comparison will show the best offers of car rental companies in Cala Millor to you, so you can book your dream car cheaply. You can arrange your stay individually and flexibly. Holidaymakers on Mallorca can drive to the beach in a cabriolet and enjoy the sunny weather. Explore the interior of the island in an SUV or drive comfortably to dinner or the theatre in a small car. You should book your rental car early and compare prices in order to find a cheap offer. Simply enter the desired travel data into the search mask and select the best offer for you. You will benefit not only from the price-transparent breakdown of the offers, but also from our TÜV-certified security guarantee. If you are not able to make use of the booked offer, simply use our free cancellation up to 24 hours before rental. The airport Palma de Mallorca (PMI) is located about 70 kilometers from Cala Millor. Visitors can use the different rental car offers and book the desired car for a cheap price. Like that they can pick it up at the agreed time after their arrival, stow their luggage comfortably and drive off immediately without being dependent on public transport. The journey from Palma to Cala Millor takes about an hour. In addition, various bus companies connect Cala Millor with the airport and offer daily transfers to the east coast. Those who make use of these offers can be driven to their hotel and pick up the rental car directly in Cala Millor. In most cases, however, the transfer costs considerably more than a rental car. Therefore a price comparison before your departure is worthwhile. If you want to rent a car in Spain, you should also check the conditions of your car insurance beforehand. Many policies already contain a corresponding international protection, so that no additional insurance is necessary. Travellers for whom this is not the case or who do not own a car themselves can take out a suitable car insurance policy with the so-called Mallorca policy. This increases the sum of the liability insurance set low in Spain to a German level and therefore offers a greater protection in the case of an accident. Thus tourists are also safely on the road during their holidays. Travellers can already book necessary insurances at domestic insurances at home. Of course you also have the possibility to select your desired insurance benefit via the search mask and filter. Whether active holidays, relaxation weekends, city trips or beach holidays: the sunny Cala Millor has to offer a lot. Despite its manageable size, the city, in which around 6500 people live, offers many interesting sights and leisure activities. Visitors can drive to the small church Parròquia de Nostra Senyora dels Àngels with their rental car or visit a performance in the cultural centre Auditòrium Sa Màniga. Monday is market day in Cala Millor. The locals offer a variety of goods on the streets and tourists can discover many interesting offers of local products, food or souvenirs. Every last weekend in September, Cala Millor hosts the Turista Festival. Visitors can travel to the festivities by rental car at a reasonable price and experience a colourful programme of concerts, dance events, sporting competitions and a final fireworks display on the beach. August 2nd is also a special day in Cala Millor's calendar. The festival Nostra Senyora dels Àngels is celebrated, which is also very popular among tourists. Guests and inhabitants celebrate the name day of the patron saint of Cala Millor. Restaurants, bars, cafés and shops complete the tourist offer of the city, so there is a lot to discover and experience all year round. Pick up your car at the rental station and spend your free time as you please in Cala Millor. If you like going for a walk you can park your rental car on the promenade. The beautiful path will lead you to the neighbouring town of Cala Bona and to a marina. The beautiful Parc de la Mar, which is close to the beach, invites its visitors to a relaxing walk in Cala Millor. Those who would like to do some sports can take the rental car to the nearby golf course. Spain vacationers love the country for its great beaches. Cala Millor has a lot to offer. Beaches like Arenal de Son Servera, Platja de Sant Llorenç and Cala Nau are among the most popular of the east coast of Mallorca and are altogether about 1800 meters long. In order to already enjoy the sun on the way to the beach, it is worthwhile booking a convertible at the car rental. The mild Mediterranean climate all year round is particularly favourable. The extensive white sandy beaches are cleaned daily and invite you to sunbathe or play beach volleyball. The clear, clean water is ideally suited for swimming with the whole family. In Cala Millor, tourists can go on boat trips, try parasailing or jet skiing. Therefore, bathing and beach vacationers get their money's worth in Cala Millor. Whether bath towel, sun cream or volleyball: in a rented car all beach utensils have comfortably place in the trunk. If you decide to book a rental car with the car rental company, you are always well equipped for your beach holiday. Palma de Mallorca, the capital of the island, is about an hour's drive away and is also a popular holiday destination in Spain due to its varied tourist offers. With a rental car, visitors of Cala Millor can undertake a comfortable and inexpensive day trip to the city on the west coast of Mallorca. The long beaches, big harbour, narrow alleys of the old town and beautiful parks of Palma are definitely worth a visit. It is also worth visiting the imposing La Seu Cathedral and the medieval Castell de Bellver. 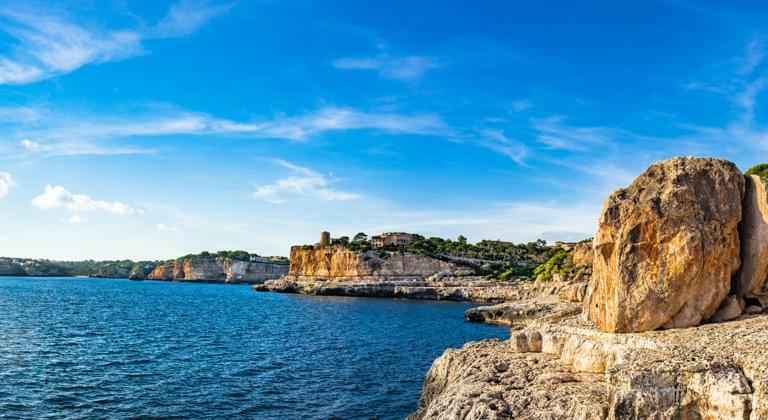 Visitors can reach one of Mallorca's most popular sights in just 15 minutes by rental car: The Coves del Drac are among the most impressive stalactite caves in Europe. They are located south of Cala Millor and have existed for several 1,000 years. An underground lake can be found here. There is also an auditorium where guests can watch cultural events and artistic performances. The dragon caves are open all year round and attract many visitors. South of Cala Millor there is the beautiful peninsula Punta de n'Amer. With your rental car you will reach the natural peninsula in only a few minutes. It is covered by a varied nature reserve and characterized by undeveloped beaches, natural rocky coasts, heath landscapes, pine forests and extensive dune regions. Several hiking trails lead through the quiet nature reserve.